Questions for the PM, live on Stuff at noon on Tuesday. "ask what you want of the Prime Minister this coming Tuesday." Why did you sanction the abandonment of one proposed policy that the voting public of New Zealand have rejected (changes to teacher ratios), when you have refuse, to date, to abandon an equally unpopular policy (asset sales), and do you accept that most people who voted for National did so in spite of the proposed asset sales, rather than because of them? What examples can you show us of higher standards of transparency and accountability from your government, and how do you reconcile your promises from 2008 with the actions of John Banks and his contempt for electoral law, and Paula Bennett with her musings on eugenics? Is there anything of an ethical or moral nature that is contentious or controversial, like the Springbok tour of 1981, decriminalisation of cannabis or gay marriage, that you would go on the record as supporting or opposing unequivocally? 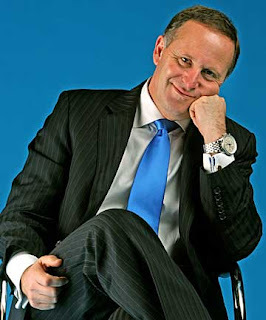 Will New Zealand be a richer or poorer country once you finish your time as Prime Minister? To which charities do you donate "a significant proportion" of your Prime Ministerial salary? Is the brighter future you promised to New Zealanders to be found in Australia or Hawaii? I can't go onto the live chat, for employer/internet related reasons, but I'm intending to email my questions in. I encourage anyone who reads this to put their own questions up. Not too many, though, because we need John in the House on Tuesday at 2pm to answer questions. Others have commented and I have to ask too, who thought it was a good idea to publish a picture like this? It's bloody awful, and the cut-down version Stuff have it on their website makes it clear that the press honeymoon is well over. Good. Of course it's quite easy to bend a question and an answer to suit your own ends - Key does it all the time. His stock method is to say, no, to any question that would reveal him, no, the reality is quite the opposite of what you say, I don't accept that at all, in fact we will be better off with foot and mouth in the country. *Smiles, displays watch. I think the Greens have been much more successful than Labour, especially this term, in forcing Key to answer questions. We could take a leaf (accidental pun used due to lack of an alternative) out of their book. Point being, if asked properly, a good question will require either an answer or clearly evasive and bad behaviour. Indeed, AC. In Council, I endeavour to ask questions in the way you describe above. It's an art and not an easy one, as evidenced in coverage of the House, where seasoned 'askers' still get fobbed-off. The Great Undoing of the best question of course, is the Outright Lie. Key has this down to a fine art also. His body language gives him away but his sycophants don't seem to notice. Today in parliament was a bit disappointing. Mostly because I missed it, but the transcript is a bit short on highlights.